What we know as corn is a large grain plant, known for its sweetness and starchy carbohydrate composition. It has a long and illustrious origin as the revered staple plant food of the indigenous American peoples who carefully cultivated hundreds of varieties of maize specific to microclimates and uses (flour, cooking, medicinal). Around the world, corn is still known as maize. At farmers markets here in Hawaii, if you find corn unhusked and still on cob chances are that the corn had been harvested in the last couple days if not that morning. Also available is fresh corn silk, a rare delicacy that makes a nice sweet addition to any salad. Also to be found on rare occasions is baby corn – immature corn harvested and often used in stir fry dishes. – Most corn found in farmers markets are still snuggled in their silk and their husks, peel away both. That’s known as shucking. – Wash shucked corn, careful to remove strands of silk. 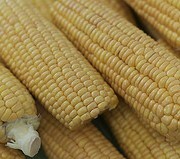 – Corn can also be left in husk and put on the grill to roast. – Corn on cob can also be boiled and steamed. – You can also remove the kernels from the corn with a butter knife or even a spoon. Then add kernels to a recipe – salsa, chili, stew, casserole, corn bread, corn pudding. Look for firm ears with tightly wrapped grassy green husks. Corn silk should look a golden brown glossy. Serve corn as soon as possible to enjoy at its highest quality, as the days go on harvested corn’s natural sugars turn to starch. If you need to – store corns unwashed, still in husk, still in bag in the refrigerator up to 2 days. You can also remove the kernels from the cob and freeze them in an airtight container or bag for up to six months.